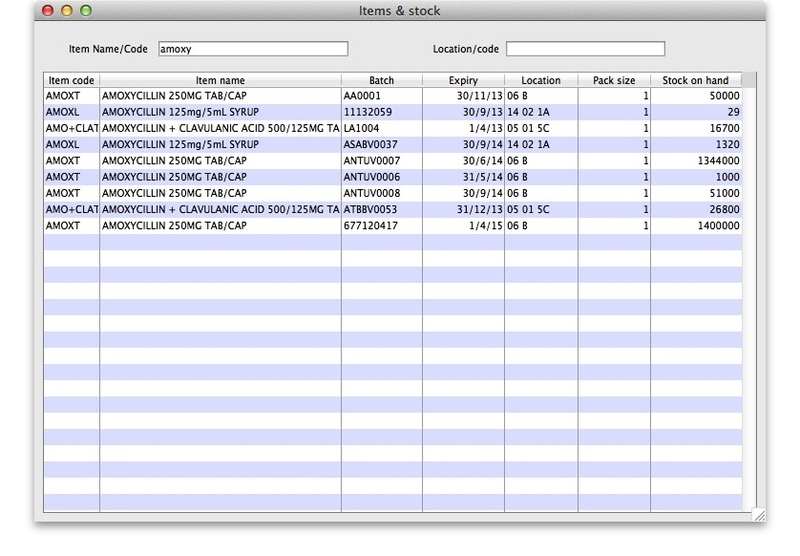 By default all stock is listed, and where the stock of an item is present in different batch numbers, each one is displayed. Just like nearly all the other tables of information in mSupply, you can order the information by any column by simply clicking on the column header. Reverse the sort order by clicking on the same column again. Listed under Available are the columns not presently displayed, and under Chosen are the columns presently displayed. Changes are made by highlighting your chosen column on this window, and moving it using the buttons in the centre to add or remove it from the display. You can drag the items in the Chosen column into the order of your choice to change the order they are displayed in the list (top of the list is displayed on the furthest left, bottom of the list is displayed the furthest right). 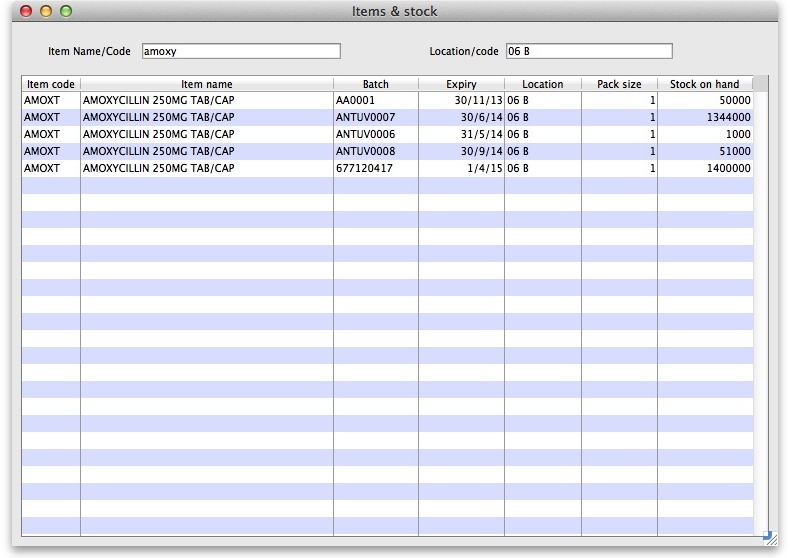 You can export the stock information on the items displayed in the table by clicking on the Export to Excel button. Only the items displayed in the table will be exported and a fixed set of columns will be exported - this set is not affected by any changes you make to the displayed columns using the Customise button described above. In your spreadsheet application you can manipulate or print the data as you please. Entering the item name or code in the box will filter the list; entering the first few characters of an item name will display only those items which begin with those letters (or numbers). To display a specific item, either the item code or the full name should be entered. To find all items containing ran enter @ran which will display all items which include the characters entered, not only those items where the characters entered are at the start of the item name - e.g. this will not only display any Ranitidine in stock, but will also display `Pyrantel', `Nitrofurantoin', Propranolol', etc..
Alternatively you can filter by location. Leave the first search box blank and enter a location into the second search box. This will show only the items with that location. 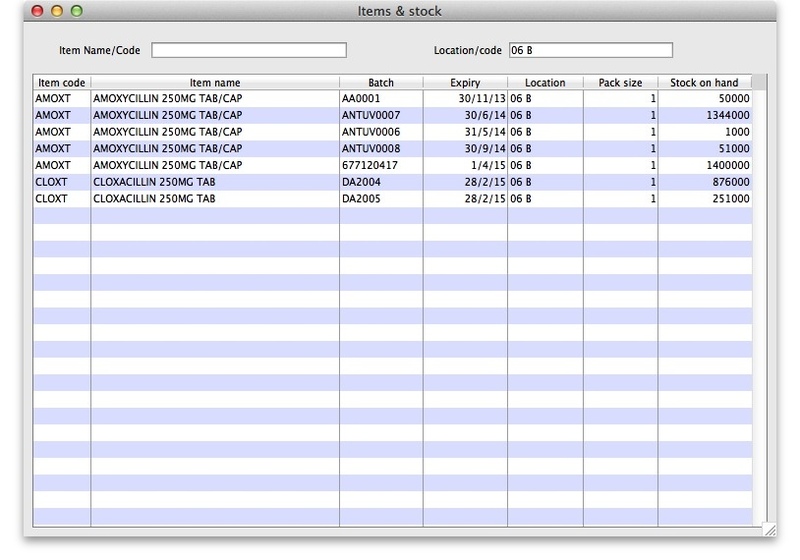 To view an even more specific selection of stock you can filter by both item name and location. By entering your criteria into both boxes, only the stock which matches your specified name and location will appear.